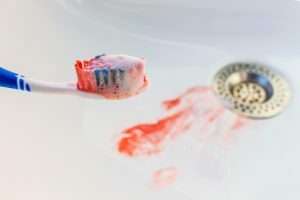 Do your gums bleed when you brush your teeth? You might be thinking that it is from brushing too hard, but it is an indication you might have gum disease (periodontal disease). Too often, people tend to believe that the bleeding is normal; however, any bleeding when you brush is a sign that your gums are not healthy. It is usually a symptom of an infection in the gum tissue. When treated early, it is easily treatable and reversible without causing long-term damage. However, if you ignore the bleeding, the infection will continue, potentially leading to the loss of your teeth. As your dentist in Medford, Dr. Anthony Giamberardino offers periodontal therapy to restore your dental health. Brushing and flossing your teeth are vital to removing plaque and tartar accumulations from the teeth, which harbor bacteria. When the buildup is not removed, the bacteria causes the gum tissue to become infected and inflamed. If the infection is not treated, it will cause pockets to form in the gum tissue and spaces will develop between the gums and roots of the teeth as the tissue starts to pull away. Over time, the underlying bone and supporting structures of the teeth become damaged, causing your teeth to become loose and fall out. It is estimated that 50% of adults in the United States have a form of gum disease but most are not aware they have the infection. The early stage of the condition, known as gingivitis, often goes unnoticed as people tend to think their symptoms are normal. The early stage of the infection causes inflammation, redness, and bleeding of the gums. In addition, you may experience bad breath and tooth sensitivity. At this point, the condition is reversible and easily treatable with a procedure known as root scaling and planing. This is a deep cleaning that removes plaque and tartar from the teeth. By improving your oral hygiene, you can prevent the infection from returning. Unfortunately, gingivitis often goes untreated, leading to periodontitis. At this point, significant damage has started to occur. The pockets in the gum line will become deeper and the roots of the teeth will become exposed. As the bone and tissue become damaged, your teeth will begin to shift out of place, become loose, and may fall out. You may have visible pus and foul smelling breathe. Treatment for advanced stages of the infection must be aggressive to prevent further complications. If left untreated for too long, the consequences of the infection may not be reversible. If you notice your gums are bleeding when you brush or your teeth no longer fit together as they once did, you may have gum disease. You need to contact Giamberardino Dental Care immediately to schedule a consultation for treatment. As your family dentist in Medford, Dr. Giamberardino will evaluate your gum health to create a comprehensive treatment plan. With a proactive approach, you can restore your dental health.